So it might not be fall yet, but I couldn't help but wear one of my fave colors for fall: emerald green! This suede skirt was a thrift find last season. I was prego at the time, so I knew it had to patiently wait in my closet until this year. It was totally worth the wait! Some other faves in this outfit are my snakeskin Kelsi Dagger heels (you can get them in leopard and pony too HERE), this awesome new cuff by Bare Collection, and my vintage earrings (big and bold, just the way I like 'em). Of course, I cannot forget to mention my cropped turtleneck. I know I'll be reaching for this piece even into the fall and winter months. Look at you mama rocking your crop top...LOVE IT! Very chic outfit! Great skirt and shoes! ohh wow, i LOVE that skirt on you!!!! Once again you amaze me with your thrift finds! Such an amazing vintage find - that color is so rich & gorgeous on you!! LOVE this look. Rocked an almost identical version for my sisters birthday. I took an old cashmere and cut it up to be slightly cropped, with a leather Zara pencil. You're lookin' gorgeous! 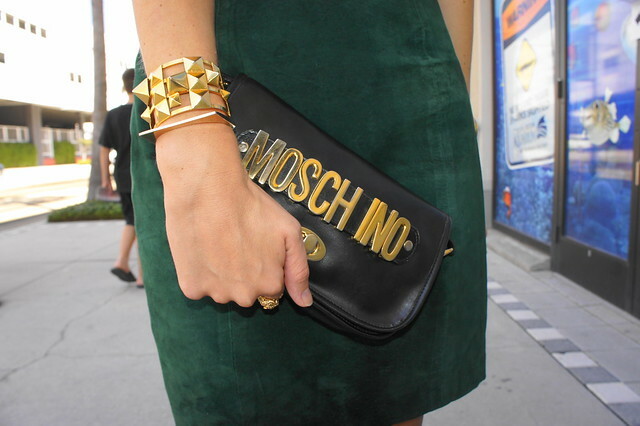 Obsessed with the emerald green, shoes, bag, et al! It was so great to meet another fellow blogger and FSU alumni! You inspire me to go thrifting more with all the amazing finds you have! Hi! I've just discovered your blog and I like it! Following u here and on fb :) Check out my blog!